Closing a business letter using good professional etiquette creates a huge impact on the recipient. The closing line should be placed on the same line as the date and followed by signature and printed name of the sender. The first Business Letters of the closing line should be capitalized and a comma is to be put immediately after it marking the end of the main part of the letter. Like salutation, closing line or word should be chosen carefully. Depending upon the type of professional relationship the line or word can be altered. “Yours truly”, “Yours Sincerely” and “Sincerely” are the most common types of closing in a business letter. 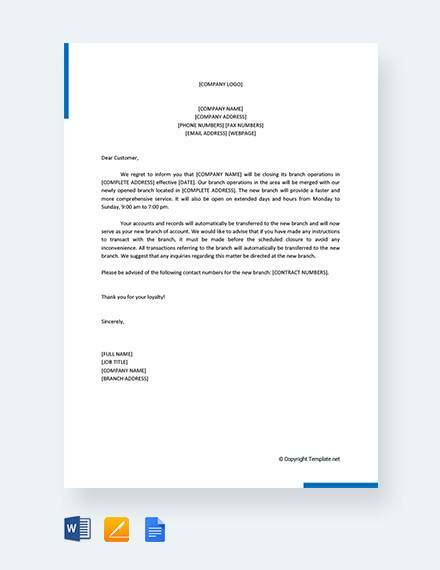 The closing business letter to employees is used to communicate the difficult decision of the closing of a business to the employees while stating the reason for the same. This template furnishes the last working day of the business. Such a notice that furnishes the exact time will help the employees to make the alternate arrangements. 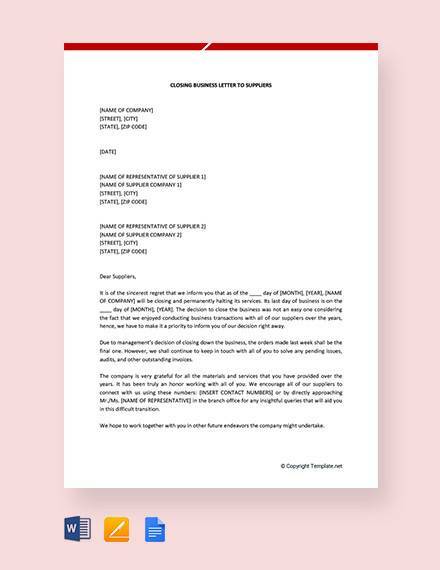 As the name suggests, this template is a notice from the company to the clients regarding the closing of a particular business. In such a template, the services of the clients are applauded. 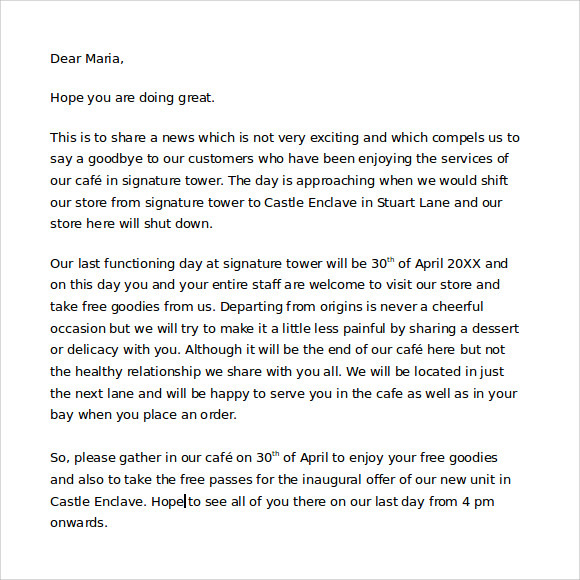 After a note of thanks for the wonderful services, the reason for closing down the business is informed along with the date for the same. Customers are the backbone of the business. 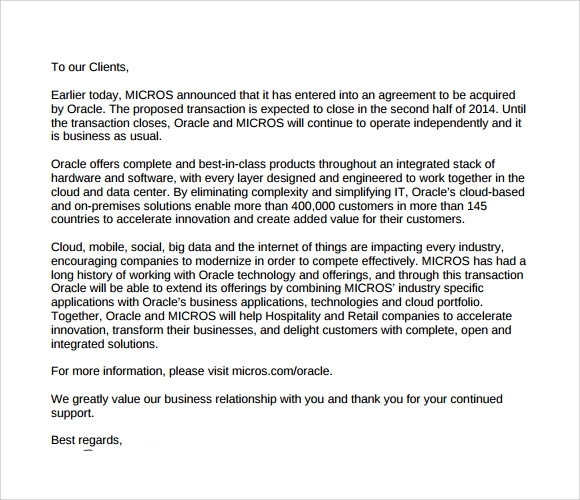 In such a template, the customers are informed about the business closure details. 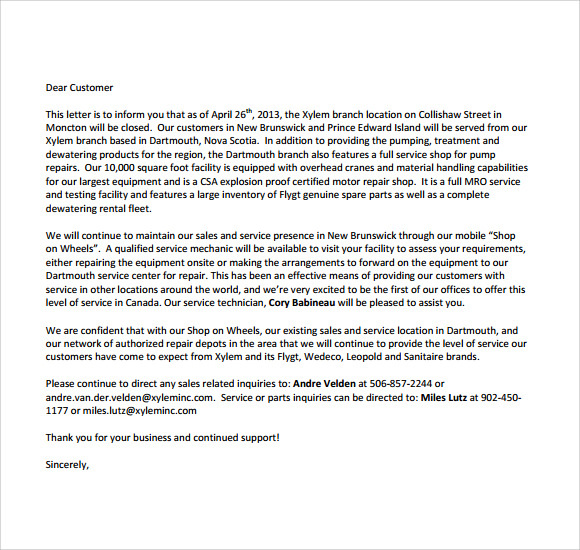 They are also informed about the locations where the company is still continuing its business. Proper business etiquettes help to foster a business well. A well-formulated closing business letter, complete in all respects will not only leave a good impression but will also help you maintain your business contacts for future. 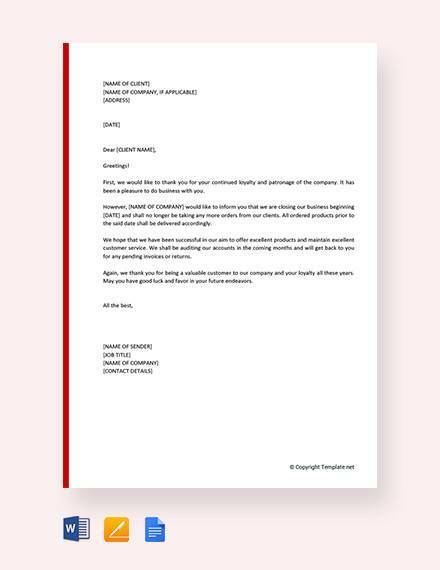 With the advent of the internet, it is easy to find a perfect closing business letter template. 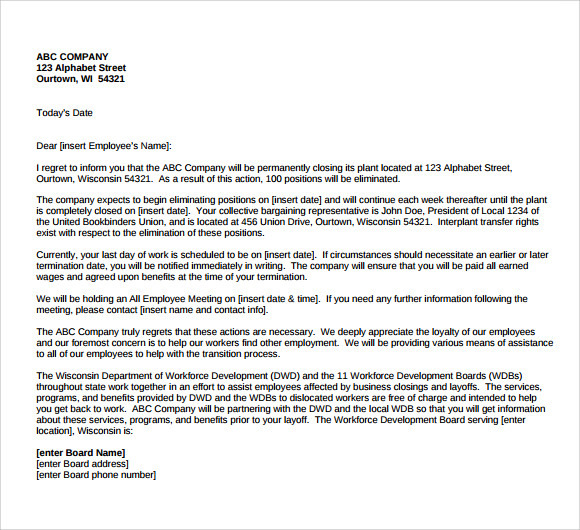 Why Does a Company Need Closing Business Letter Templates? Even if a business is closing, or the employee is making some new moves in the business sector, it is important to be professional. Simple and concise Closing Business Letters give the clear-cut reasons. Such a letter will never leave the employees, clients or customers puzzled about what is going on in a company. 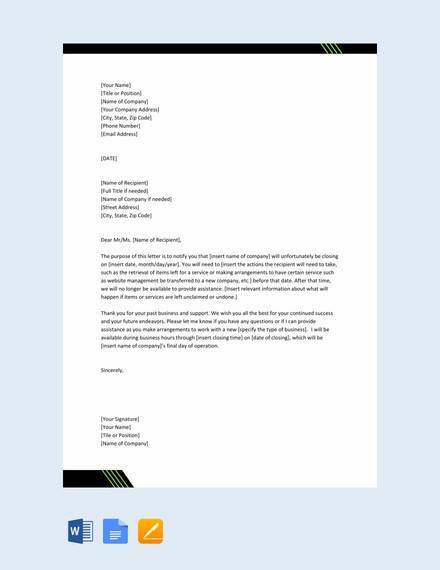 The letter also gives a chance to the employee to thank everyone for supporting him in his venture. Also, it looks more professional and builds trust when the clients or employees get to know about this news directly from the employer. 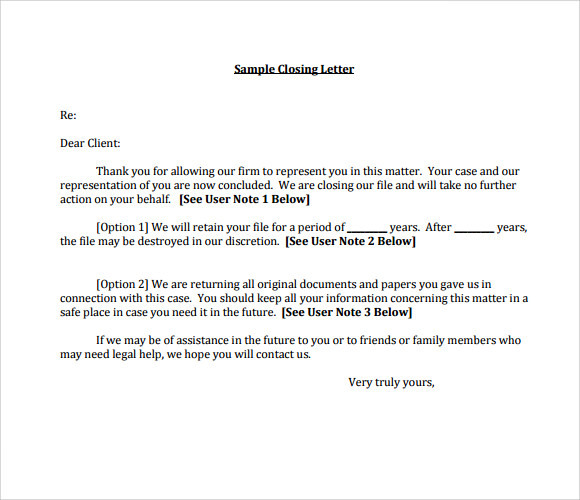 When Does a Company need Closing Business Letter Template? There may be times when even after a lot of trying, the business is not flourishing and the required results are not coming up. At other times, a company might be going short of funds because of the recurring losses which are borne by the company. 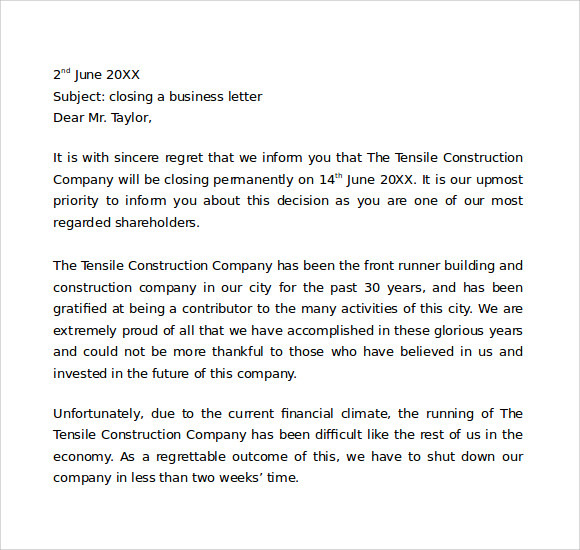 Each business closure may not necessarily have the same reason. 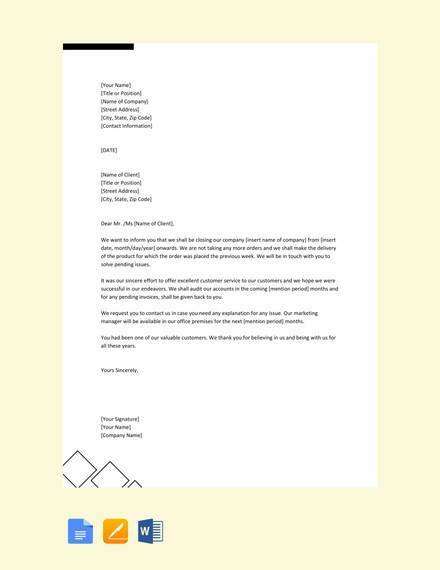 A closing business letter template saves a lot of time as they are the tailor made blueprints. Such templates help the employer to terminate the business on a positive note. They also help the attached parties to chalk out a plan of action for their future. Once a decision to close a business is made, hanging a closed signboard on the entrance of an office doesn’t really look professional. 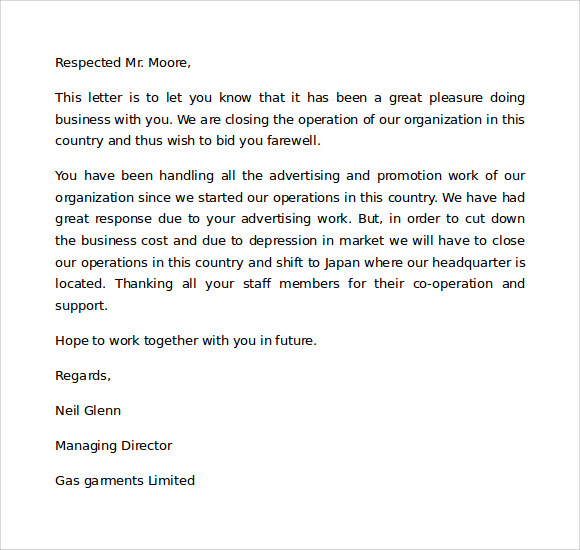 Thus, a good closing letter is a great way to thank the key players who have been instrumental in your business.